Just then, the front door of their shared home opened. Roman heard Seth kick off his shoes and his footsteps began to echo throughout the house. 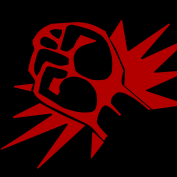 "Seth!" Roman called. "I got you an early Christmas present. C’mere." "Roman, can’t my present wait until Christmas Eve? I don’t like early presents." Seth said as he came walking to the living room. 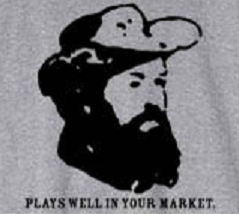 "You’ll love this one. I promise." Roman said. As soon as he heard Seth was near the room, he sat the puppy down on the floor. The puppy quickly began to run around. As soon as Seth walked into the room, the puppy ran toward him and started to try and play with his feet. 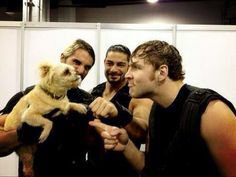 Seth looked down at the puppy and then up at Roman, his eyes wide. “Roman, did you get me a puppy?” He asked, bending down to scoop the puppy up in his arms. The puppy happily licked his face and Seth smiled. Roman smiled seeing Seth smiled as he slowly nodded his head. “Yes, I did. It’s a boy. I didn’t name him. I know you love animals so I figured I’d get you one.” He smiled. "Anything for you, baby." Roman said, kissing him back softly. "So what’s his name?" Blade threatens to summon Mike Check back onto the airwaves. Having missed Black Friday...again...the Co-Fruitcakes attempt to combine that into this week's proceedings. This results in Blade getting sick. This results in RD wondering about their 200 listeners. Blade wants a ChimpTrolla. He also saw a movie where the Mexican Santa Claus played a villainous mad scientist. He repeats his story of finding a knock-off Santa Claus VHS tape where Santa fought dead air. (:08) RD talks about his latest induction of Jingle All The Way where Ahnald had to deal with an annoying young-er Anakin Skywalker. Blade lies by saying he is not drunk in believing that Episode I wasn't that bad and wondering what Yoda's son what would be named. Trish Stratus is in some ballet adaptation of The Nutcracker doing something or other. (:50) She also sells her own tea for some reason (named after her son Maximus). Also for some reason Mickie James has named her child...Don. Blade listened to a Ross Report where some listener remarks how close by his angry doppelganger is. (:55) The phone expectantly rings...but instead it's Sir Alec (:58) causing Blade to crack up for some reason. He reads a story about Roman Reigns buying a puppy for Seth Rollins for some reason. This causes Blade to laugh for some reason. 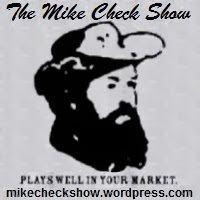 :67 Blade 'gifts' RD with Mike Check music and a segment that he's sure to forget about about having "Fun With Tammy". This just involves the two going through her Wish List. Again. RD gifts Blade a Bossk mask and gloves for Sunny to use. WCR Video: Minisode Flashback #088: Merry Xmas, Johnny Six! 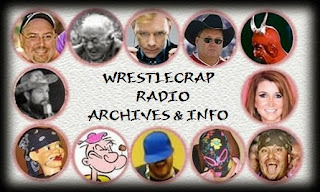 Wrestlecrap Radio's RD Reynolds recently appeared on Episode #35 of "Rowdy" Roddy Piper's podcast "Piper's Pit" where (*spoiler alert*) Piper mentions that WWE was almost thrown off the USA network because of complaints from viewers who's children were upset that he had beat up Santa Claus (although it was obviously Bobby Heenan) on National TV. 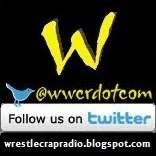 ...And Merry Christmas from wrestlecrapradio.blogspot.com everyone! Ana a "Oh Baby Jesus!" Now you've seen the video; so here's the Don Mason Boogie...with added commentary from Wrestlecrap Radio Episode #133.